Adding cayenne to your diet plan is a no-brainer. Cayenne, along with other peppers strengthen digestion and lessen the change of bacterial infections from unsanitary food and water. Cayenne peppers also lessen the gas and bloating that comes from eating heavy, greasy foods. Cayenne helps boost your metabolism and induces the body to burn off more fat. It also serves to clear congestion caused by colds or allergies while reducing inflammation. 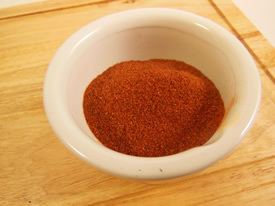 Add a pinch of cayenne to a cup of herbal tea to spice things up and activate the other herbs in the blend. Cayenne works well in cold remedies to immediately clear sinus congestion and raise the tempo of your metabolism. It can be combined with other hot spices such as ginger or black pepper. Recipe Instructions: Herbal Tea :This stimulating spice is rarely used in a tea alone, but is added in small amounts, generally less than 1/8th teaspoon. Circulation :Poor circulation makes itself felt in many ways including fatigue, poor concentration and swelling in legs and feet.